Update: We got word late last night that the device was currently available, officially and for only $99! 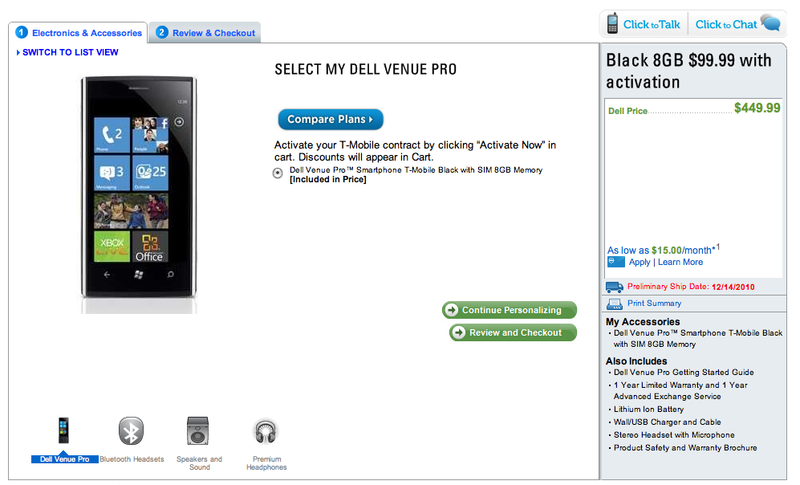 Check out the pic below and hit the link to scoop up this bad boy Windows Phone 7 device! This is a very welcome but surprising turn of events in the Dell Venue Pro saga. It’s now available for order! We’re looking at an 8GB version of the Dell Venue Pro and we should put it out there that a 16GB model is also to be had though currently not available to order. Because it does not have user replaceable memory, some of you may want to hold off and spring for another $50 dollars for double the memory or you might just want to jump on this right now before the link disappears. If your itching to grab the device now, double the memory be damned. The link below will fulfill all your fantasies! Thanks, Damian! You just saved me $50 on my order. Thanks!! Saved $50 on the 16 Gb. Nice. I am sooooo tempted….! do it !!!! you only live once !!!! Not sure what this means, can someone explain it to me. it means the black 8gb phone will run you $99 with activation of a new line. not that it is offered in any other color. i paid full price-I dont want have nor do i want a contract. that’s the version for African-Americans. What do you THINK it means??? Sheesh. Just ordered my Dell Venue Pro. I am leaving my Blackberry after so many years. I sure do hope I like this phone. Merry Christmas to myself !! Even better, the 16GB is available and so are the family plans. Say what you want about Dell but their customer service was excellent. When I added the 8GB to my cart and attempted activation it only gave me Individual phone plans as an option. I decided to try their online chat with a representative and got hooked up with a Family plan as well as the 16GB! I can’t wait for Christmas now!!! I had to talk with their customer service agents. They’ve got my order in but need to call back once its available in their system but they say that is very soon (this week probably). LOL… all of your orders will be cancelled within a day or two. This link was up 2 or 3 weeks back. If you go to the dell.com/venuepro page, it still says “Coming Soon!”. Until that is updated and says ready, you can’t order the phone. It’s “updated and ready” on their main Venue Pro page. Pretty confident about orders being cancelled there, aren’t we? Haha… just didn’t want to be disappointed.. again! Ordering the 16GB version now! i hope tmobile or microsoft will get these sooner than this site. I have the 8G version now. You definitely want the 16g version. The 16GB version is available to order now. Do you guys think these are available at the Microsoft stores? I like to try things before i make up my mind. I paid for the overnight shipping… estimated delivery date is the 14th… I sure hope it gets to me no later than the 10th! Don’t really care for WinMo phones. Your right! Oops My mistake. You can’t order an upgrade via the web. T-Mobile validation requires a phone number to be submitted and Dell ordering process doesn’t collect one from you to submit So when they try to validate your account with T-Mobile it fails because Dell simply passes on a blank phone number. Seems like a very basic thing you would want to check before you start taking online orders. Dell asked for my phone number & account holder information and validated my upgrade. at which step did you get asked for the phone number, I just tried again and it didn’t ask for it. I’m now stuck waiting for customer service to call back. I went through the whole process and did online verification approval but still did not apply the discount. I had to call and speak to customer service. They took my order over the phone and applied the discount. Yay! Excellent Phone, Excellent Price. If I weren’t so gaga over Android, I’d get one. Actually almost DID buy it an Alternate phone this morning. Windows Phone is going to be much more pleasant than Android, especially after the updates early next year! Shows Dec 9th for me. Sorry to hear that, disappointing. As soon as I get the funds together I will purchase the 16gb version. I dont know where any Microsoft Stores are, else I would go there and get it sooner, rather than having to wait.